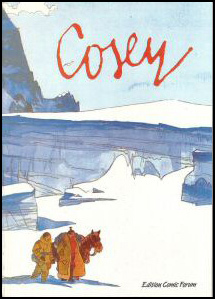 The book ‘Cosey’ was published in 1988 by the Vienna based company Edition Comic Forum. It is written by Dinu Logoz, in german. It is a great book for Cosey-fans: a lot of unknown short stories are printed in the book, as well as many unknown drawings. Furthermore, Dinu Logoz offers an overview and analysis of Cosey’s work that is highly readable. Dinu Logoz has written a book consisting of around 15 short chapters, that give insight in Cosey’s production (until 1988) and an analysis of his works. These analyses are the most interesting part of the book, especially the chapter ‘Begegnung & Wandlung’ (Encounter and Change). In this chapter Logoz shows that all Jonathan books have the same fundamental structure: people are looking/searching for something, and by encountering Jonathan and communicating with him, they discover that what they were looking for can be found within themselves. In the first two books, Jonathan himself is still looking/searching. From the third album onwards, the people who meet Jonathan are looking/searching with Jonathan as an observer. A convincing analysis by Dinu Logoz, that also explains Jonathan’s stange position as a ‘comic hero’: he is not the classic hero that takes action, but an observer. The book also contains an interview with Cosey, in which Cosey explains his way of working, his ideas, etc.